For years, many motivational speakers have encouraged their audiences to join ‘Automobile University’ to grow mentally during long commutes in their car. Over the years, inventions like the cassette Walkman, CD players, MP3 players, and today’s smart phones have opened up new avenues with the same end-goal. Personal Audio Players are wonderful devices. I brought my first MP3 player in January 2002 as part of my goals for that year (to replace the cassette player I bought in 1992). 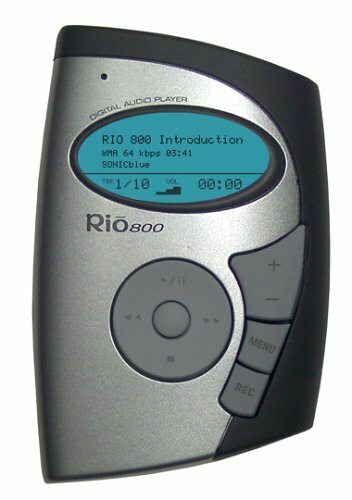 It was a Rio 800 (see picture above) and a very sleek device for the time. Note: I really liked this player; yet, it was not robust nor built for longevity as it only lasted 13 months. I quickly burned all my CDs to MP3 so I could listen to my music. However, I had made a commitment to myself that 70% of the time I would use my Rio to listen to educational programs and audio books. I go for a one hour walk daily. Instead of jamming to tunes, I use that time to enrich my mind as well. I believe this is a great way to have your cake and eat it too. I will admit, I’m a big fan of audible.com and have listened to over 200 books with this service since joining in 2002. However, you can get many free audio programs from the web, your local library, and friends. Also, there are huge number of high quality podcasts as well. Let us do the math. First, I will assume that you are only able to do this 5 days a week and that you have two full weeks of vacation a year. Second, I will assume you only can budget one hour a day to listen to audio programs. Now, the average length of time for a non-fiction audio program is 6 hours. This means that you could listen to over 40 books, on any topic you choose, in a single year. Listen to 40 books on 40 different topics and you’d gain a wide breadth of knowledge. You could also concentrate your studies on one core area and become a subject matter expect. Imagine how much information you could learn in your field after assimilating the material from 40+ books. If you continued to do this for ten years, that would equal 400 volumes. The numbers dramatically increase if you decide to include one or both days from weekends as well. If you you’d like to include some top-notch fiction in your program, I’ll recommend the 4 plus 1 plan. This means for every 5 audio programs, 1 would be a novel, short-story, poetry, or play of your choice. I know several people who swear that well-written science fiction has helped them with breakthrough concepts in life and work. The good news about Audio University is the tuition is extremely low. I highly recommend combining this ‘class time’ with long walks as you are able to impact both mind and body simultaneously. There is a very high ROI so start your unique program of study today.